While integrated models are able to provide a more complete representation of hydrologic processes, they have not yet seen widespread application within Ontario. To address this knowledge gap, the Ontario Ministry of Natural Resources initiated a study to determine the applicability of integrated hydrologic models to Ontario watersheds. 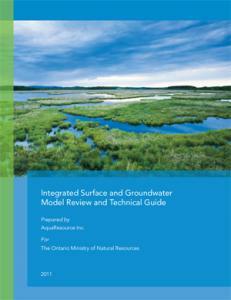 The report includes: a qualitative comparison of several integrated model codes; the application of multiple integrated model codes to two case-study watersheds; and guidance to water resource practitioners on how to develop and calibrate an integrated model.